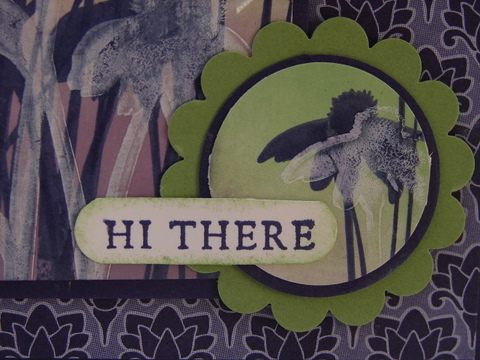 Further to my Just Add Ink Sketch Challenge Card this week – that is stamped using the 3 D stamping technique – I also ran a 3D stamping class. 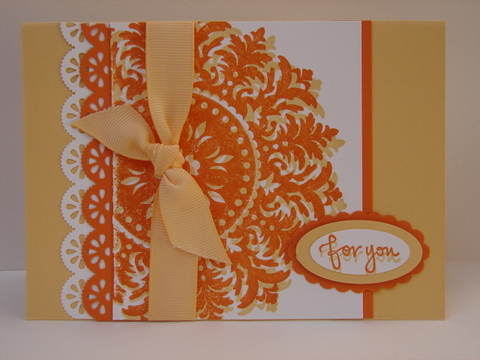 These colours are So Saffron, Pumpkin Pie and Whisper White. We used the Medallion stamp. This month is Anxiety & Depression Awareness Month. To promote awareness of this Just Add Ink has decided to do a Just Add Blue Challenge this week. This is a topic that is very “Close to Home” for me personally. So I was keen to participate in this Challenge and urge you all to as well. Another part of our Challenge is to ask everyone to do a RAK with their card – send it to someone special, not necessarily someone who is depressed or suffers from Anxiety, but someone they care about, just saying they care. So come on everyone….have a go. 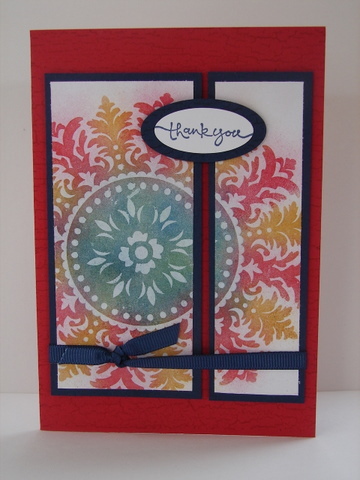 I used the Medallion again this week…..it’s such a great stamp. It’s very hard to see in the picture – but I used the Shimmer Paint on this Card…so it’s actually quite glossy and shimmery. The colours are Not Quite Navy, Navy, Crumb Cake & Marina Mist – which is my new fav colour. Here is the link to Just Add Ink so you can go and check out all the amazing Design Team Entries. And….We will have an Anxiety & Depression badge in the JAI sidebar for you to put up on your blogs. This pic is a bit more shimmery…. Continuing with the Just Add Ink Bling Bling theme – cause there are just so many beautiful things you can do with Bing Bing……here’s another one for you. 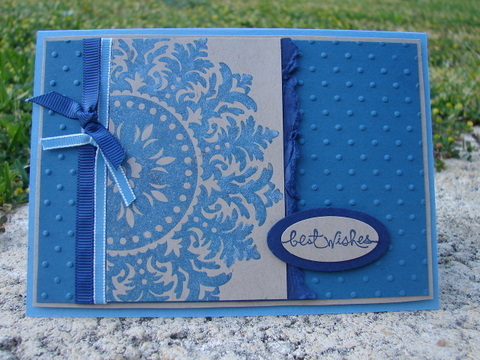 When I made this – I had a Wedding Theme in mind…. although it’s probably a bit bold for a Wedding Card. I’ve used Whisper White and Elegant Eggplant. 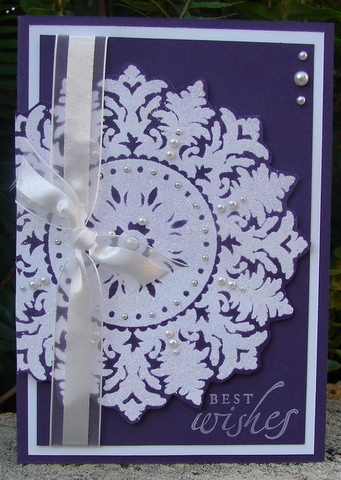 I embossed the Medallion Stamp onto Whisper White card with a mix of Clear embossing powder and Dazzling Diamonds Glitter and then used my Brayer to go over the top with the Elegant Eggplant. 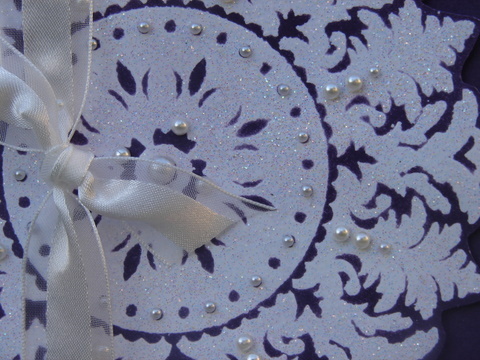 Then I layered it up on the card and add the White Organza Ribbon and Pearls. Here is a close up. Way back in May – I spent a huge 5 days crafting…..it was so much fun – I used an entire roll of double sided tape but had a ball. Today I thought I would share a set of four cards that I did then. 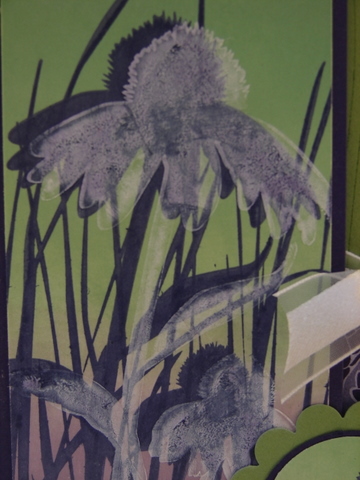 The idea around these were to use the same colors, stamp sets and technique. And I kinda was going for a “Man” card theme too. So the colours are: More Mustard, Real Red, Night of Navy & Garden Green. 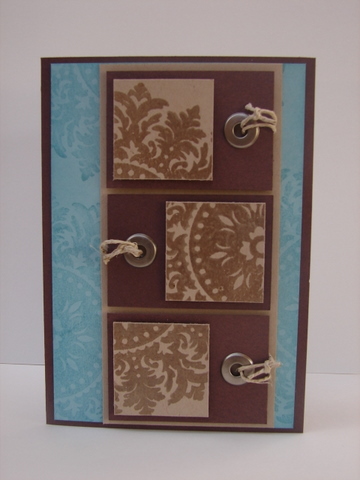 I’ve used the Medallion & Short & Sweet & Weathered Stamp sets. Ohhhhh – Happy New Catalogue everyone!! Yay it starts today!! 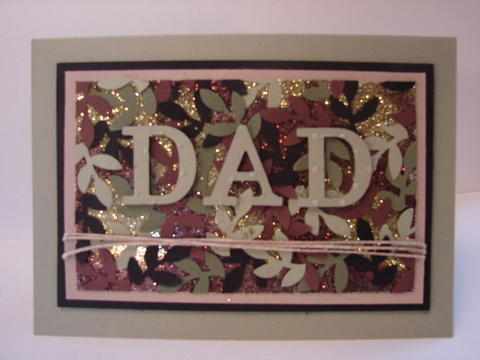 With Father’s Day fast approaching – I thought I would do a Fathers Day / Man Cards Class. 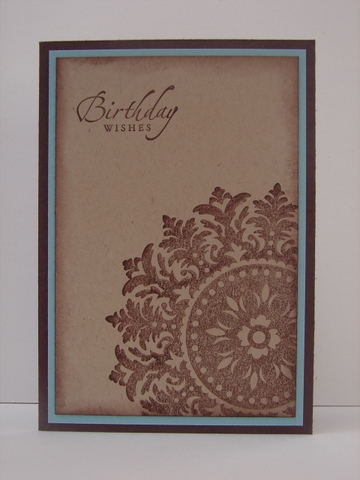 The first card is the one I did a few weeks ago for a Just Add Ink Challenge. At the same time I also did this one too….. I was really happy with how this turned out. I had been thinking about it for a while and where-ever I have been lately I have seen camouflage things, fabric, clothes, drink bottle covers etc. Anyway – I decided to give it a go. I used the leaves from the Bird Punch and stuck them onto some paper. Then I glittered the gaps with Chocolate Chip and Old Olive glitter. Then over the top I used the Timeless Type Junior Alphabet Big Shot Dies to write the word DAD. Colours are Mellow Moss, Basic Black, Chocolate Chip and Always Artichoke. 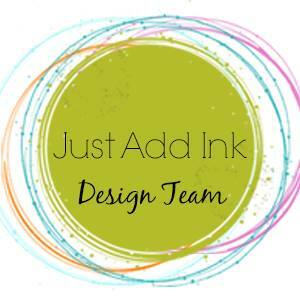 Wow – Just Add Ink # 28 is up – and I am soooooo looking forward to seeing all the entires because the theme is Just Add A Man Card! Man Cards are something that I know lots of us struggle with – so that is why I am looking forward to seeing all the creations. 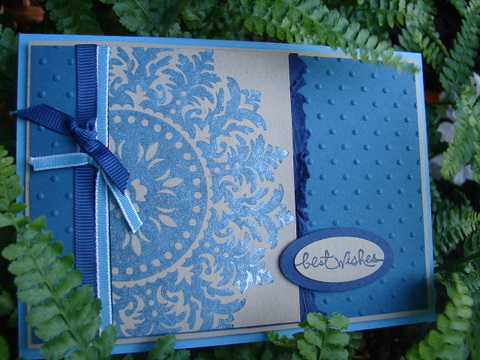 And here is the card I did. I used the Medallion Stamp for this. Because it’s a Man Card – I asked my Husband what he thought……he said – “Yeah – it’s Man enough – it’s got Studs”! Later – I also made this one. This is the Medallion and Sincere Salutations. So – put your Man Card together – and go over to Just Add Ink to enter the challenge. Gee – what a busy week I have had. I’ve hardly even had time to play in my Craft Room. Sad but True. I’ve just finished tonight’s Card Class but before I head off to Bed I thought I would quickly post the Cards we did here. 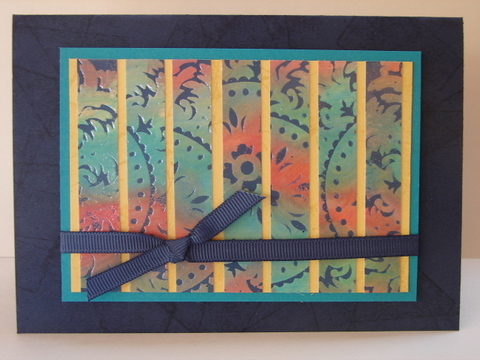 The first one is one I have already posted on this Blog on 18th June – as it was also one I did for a Just Add Ink Colour Challenge. 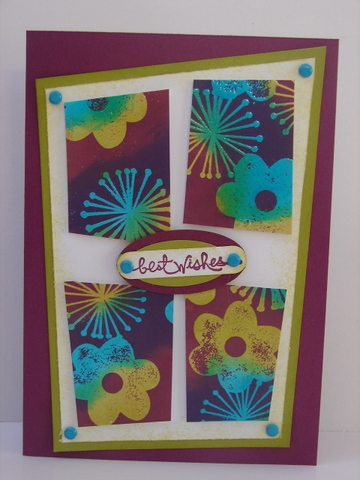 Here I have used Kiwi Kiss, Tempting Turquoise, Whisper White & Rich Razzleberry with Stamps from the Good Friend Stamp Set. The other Card we did was one I did for a Team Challenge in June also. 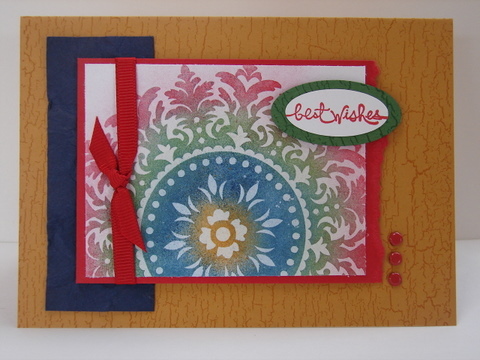 This card is done in Night of Navy, Taken with Teal, So Saffron & Rose Red with the Medallion Stamp. This is such a fabulous Technique. Very effective and a great use of colour. You should give it a go. I’ll show you another one tomorrow.